AMASWINTHUS, a monk and later abbot for over forty years at the Abbey of Silva de Málaga in Andalusia. St. Amaswinthus reposed in 982. DEMETRIUS, HONORATUS, and FLORUS, (Date Unknown), believed to have been martyrs in Ostia, however there are no details, including dates, of their lives which have survived. It is possible that they are the same saints as SS. Demetrius and Honorius venerated on 21st November. FLAVIAN, a former prefect of Rome who is said to have been the husband of St. Dafrosa of Acquapendente (4th January), and father of SS. Bibiana (2nd December) and Demetria (21st June). Julian the Apostate had him branded on the forehead as a slave and exiled to Acquapendente, Tuscany. St. Flavian reposed in 362 from torture and abuse. HUNGER, consecrated the thirteenth Bishop of Utrecht in 856, he was forced to flee his See by Norman invaders. St. Hunger sought refuge in Roermond, then Deventer in present-day Netherlands, and finally in Prüm, in present-day Rhineland-Palatinate Germany. He reposed at Prüm in 866. 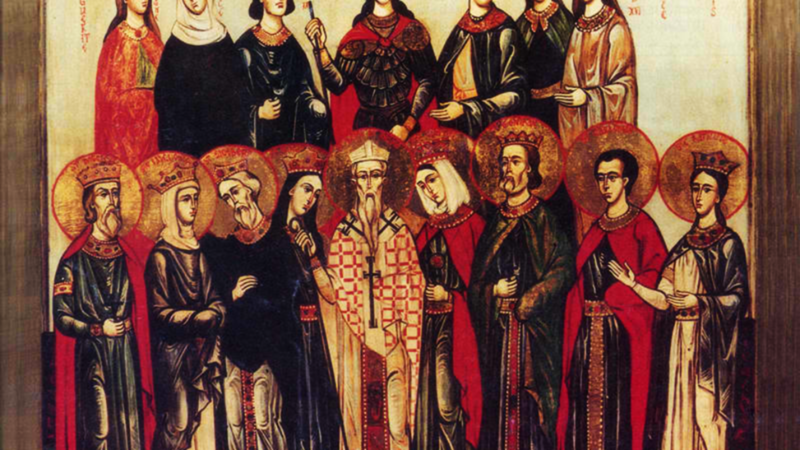 MARTYRS of ROME, a group of thirty Christians martyred at Rome circa 303 during the Diocletianic Persecution. They were buried on the Via Lavicana outside of Rome which has led to them also being known as the Martyrs of Via Lavicana.